Leur réalisation anxiogène n'est pas dépourvue de clichés stylistiques (effets-chocs tonitruants, brume nocturne gothique, éclairs menaçants, chuchotements parvenant des murs), mais elle sait mettre en valeur les enjeux dramatiques puissants du récit: deuil, rationalité scientifique versus superstitions bibliques, culpabilité, etc. 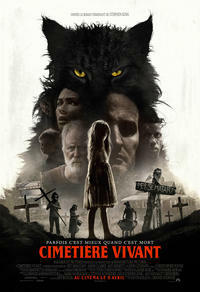 Smartly written and directed with a quick pace and a few discomforting images, this return to the PET SEMATARY is certainly one worth taking. A new version of the author's tale of a haunted graveyard reminds you that sometimes dead is better -- and that remakes aren't all bad. That said, Pet Sematary's final scene captures the ambiguous creepiness of the novel's end while totally reinventing its content. SXSW 2019: Whether you're familiar with the Mary Lambert-directed original or coming in cold, this creepy tale will get under your skin.